Office culture and technology is always changing. The push for a mobile BYOD (bring your own device) workplace is ongoing. And while mobility makes data more accessible and decreases time spent on electronic document management systems, it also presents new security challenges. Every mobile device multiplies security risks. Upgrading print infrastructure will significantly enhance data security for your company. Choosing the right copier equipment is a critical component to secure data management. The latest multifunction printer technologies come with embedded features for security. For example, Konica Minolta’s bizhub series offers bizhub SECURE; an extra level of hard drive protection through locked password access. This extended password protection, combined with encryption and automatic deletion of temporary image data, make these printing machines ideal. Extensions such as user authentication also ensure that only specific individuals have access to print. How many times have you seen documents abandoned at the multifunction printer? Every time this happens, sensitive information is left vulnerable. Secure print release and “pull printing”, such as from PaperCut, allow a user to send print jobs to a secure queue and print from any machine after authentication. Print release ensures that no person but the initial user can release and collect a print job and significantly reduces the unintentional exposure of sensitive data. 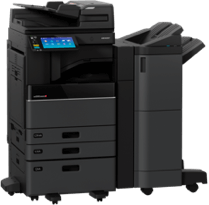 Similarly, Toshiba’s e-Bridge Print &amp; Capture allows for secure print with options for Private Print or Hold Print with user authentication and department codes. 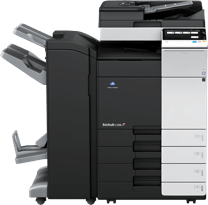 It brings users cloud connectivity for Box, Dropbox, Google Drive, and more on an e-studio MFP. Printing from the cloud is an attractive concept that eliminates the need to coordinate hardware in multiple locations. It’s a productive way to work in a fast-paced environment. For some government agencies, healthcare or financial organizations that handle highly sensitive or confidential files, a private cloud service is a solution. This cloud ensures that servers that host data only belong to the company. A secure firewall protects the data, which means print jobs sent to machines on the network will be safe. This option allows companies to have more control over policies of use, including suspension for mobile users if needed. Print services like Google Cloud Print enable secure printing from virtually any device from Google applications such as Gmail or Drive. Documents are deleted from Google’s servers once the print job is complete making it a simple and secure solution. At Busys.ca, we understand the necessity of securing your small business’ assets through electronic document management systems and IT services. Our customized approach ensures that our customers meet industry standards while reducing costs with quality multifunction printer and copier solutions.